When Ernie Hass moves his wife Lily and their daugher Girlie to the coastal town of Dongarra (historical spelling of Dongara from the time the book was set) in 1932, it's not in the happiest of circumstances. Ernie is bankrupt-- his farm was mortgaged up to the hilt and he was counting on subsidies that never came in. He moves them out to a run down property by the beach front, hoping for a fresh start. His plan? To open a guest house with a little shop. Yet the reality of the situation seems dire to his wife Lily, who is already feeling the strain on their marriage. Forced to give up her position in society and all her nice things-- including a beloved sewing machine, which allowed her to design and alter her own dresses, Lily feels more trapped than ever, and her frustration is beginning to seep out and colour her interactions with her family. When her brother Tommy shows up, suffering from shell shock after having been enlisted during the First World War, it's just one other complication in Lily's plans to make a good start in the new town. 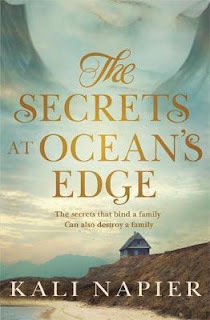 The Secrets at Ocean's Edge is that rare thing-- historical fiction which takes a deep, authentic look at the reality of difficult times in history, rather than looking for the glamour and nostalgia. It is clear from reading the book that Kali Napier has done her homework. From the descriptions of the town, to the inclusion of Indigenous characters, Napier's approach to recreating Dongarra during the Depression has been done with an anthropologist's eye-- fitting given that she is an anthropologist. If a reader were to pick this book up expecting romance and happy endings, they would be sorely mistaken. Like other similar books which have come before-- two examples that spring to my mind are The Dressmaker and The Light Between Oceans-- the aim of this book is not to mythologise the past, but to tell a story about what life was really like during this difficult time. And there is extremely little to fault in Napier's recreation of small town life during the time between the wars. Her attention to detail makes the reader feel like they are truly there. Napier also has superb control of her subplots, and that is what makes this novel so completely original. The lives of her four protagonists, each of whom tells parts of the book from their point of view though the narration style is third person, are perfectly balanced against one another. For Ernie, this is a book about his attempt to make good after the failure of his farm, and the feelings of inadequacy he faces when he feels he may be unable to be the man of the family and support his wife and daughter. For Lily, it's a story of her attempt to find a good place for herself in the society she has come to, as a means of atoning for marrying a man she believed to be below her station all those years ago. A secret from her past threatens to unhinge her plans. It is very easy to relate to the harsh woman Lily has become once you see how she got to be that way. For Tommy, the story is about trying to find his way back to himself after the war, despite how difficult it now is for him to relate to others. The only person he wants to look after him is his sister, but she is pushing him away. And for Girlie, it is a story about growing up in a town where you don't fit in, and where people are cruel. Girlie was perhaps my favourite character. She was the only innocent one, though she felt guilty about a lot of things it seemed. Like many children, she was unable to see differences like race, and saw nothing wrong with talking to people from other cultures and becoming friends with them, even though it got her into trouble. Though perhaps it is likely she would later pick up the prejudices of her parents, for the duration of the story, Girlie is that wonderful creature, pure of heart, who approaches every new person as a possible friend. It is this combination of characters who carry this story, and make it the book that it is. I enjoyed The Secrets at Ocean's Edge very much, and my only criticism is that there should have been more of it. I would have liked to have seen some of the plot lines be drawn out in more detail, and for the climax and denouement to have taken more time to tease out for the reader. To live in the world of this book for only one day simply was not enough.